Visit Philadelphia debuted a brand-new television commercial that highlights the city. In the City of Brotherly Love, there are some things still worth fighting over – like the title of the city's most iconic legends. 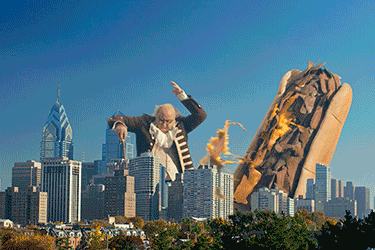 Just ask Ben Franklin and the Philly cheesesteak, two larger-than-life Philadelphia staples who were captured vying for the spot in an epic, Godzilla-like battle over the city skyline. And while there's no proof of who won, let's just say wiz was slung on the city streets.